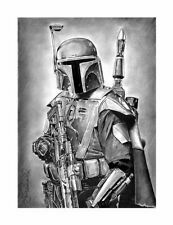 Star Wars Boba Fett Bounty Hunter The Empire Strikes Back Original 8”x11” Art. This page was last updated: Apr-23 07:43. Number of bids and bid amounts may be slightly out of date. See each listing for international shipping options and costs.